It was 1885 and James B. Ward of Lynchburg, Virginia, was ready to give up. After twenty years of puzzling over a difficult problem with limited success, Ward knew that he had little or no chance of solving the whole thing. He decided to throw the problem open to the public and see if anyone else could be successful. For this reason, he published a pamphlet with the lengthy title: The Beale Papers containing Authentic Statements regarding the TREASURE BURIED in 1819 and 1821, near Bufords, in Bedford County, Virginia, and Which Has Never Been Recovered. In this pamphlet Ward told a strange story. Ward wrote that according to letters written from Thomas J. Beale to Robert Morriss, Beale had led a party of thirty men west in 1817 on a buffalo hunt in northern New Mexico. While out west they discovered a rich vein of gold and gave up hunting in favor of mining. By 1819 they had accumulated a large store of gold. According to the account ...the question of transferring our wealth to some secure place was frequently discussed. It was not considered advisable to retain so large an amount in so wild and dangerous a locality, where its very possession might endanger our lives; and to conceal it there would avail nothing, as we might at any time be forced to reveal its place of concealment. The men decided to move their horde by wagon back to Virginia. 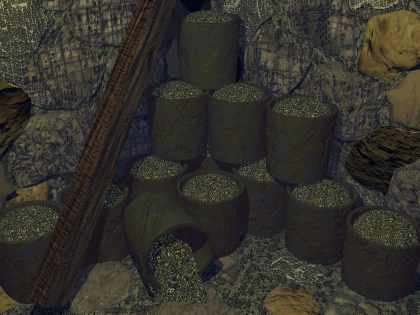 They brought it back in two shipments and buried the gold in iron pots in a secret vault roughly lined with stone some six feet beneath the ground. The treasure consisted of 2,921 pounds of gold and 5,100 pounds of silver, as well as jewels obtained in St. Louis to save transportation. In 1982 one journalist investigating the Beale story estimated the modern value of the treasure to be 30 million dollars. According to Ward's writings, the group entrusted their secret to Robert Morriss of Lynchburg while they traveled back to west to get a third shipment. Morriss was given a strongbox with instructions not to open it for ten years. If the men failed to return by then, Morriss was to open the box. Inside the box were instructions and a series of cryptograms. Morriss would have been given keys he would need to decode them. He was to use the secret information in the cryptograms to uncover the treasure and disperse the money among the men's surviving relatives. Morriss was true to his word. When the men did not return he not only waited ten years, but twenty-three. When he opened the box he found three cyptograms and a letter of explanation. The cryptograms consisted of a series of numbers from one to three digits long. Morriss, who was never given the promised keys to the messages, worked to decrypt them for years, but failed. About a year before his death in 1863 he passed the box onto Ward. Ward, by accident, solved one of the cryptogram ciphers. He was able to decode the message by consecutively numbering the words in the Declaration of Independence, then swapping those words with the matching numbers in the cipher number 2. The message he was able to decode gave him a list of the vault's contents. The other two messages, which were supposed to carry the location of the treasure and the list of men who were part of the group, Ward failed to decrypt after many years of trying. Ward blamed his financial problems on his compulsive pursuit of an answer to the two remaining cryptograms. To put the matter behind him he decided to make the whole affair public: ....I resolved to sever at once, and forever, all connection with the affair, and retrieve, if possible, my errors. To do this, and as the best means of placing temptation beyond my reach, I determined to make public the whole matter, and shift from my shoulders my responsibility to Mr. Morriss. After Ward published his pamphlet many people tried to decode the messages. Most failed. A few decided that they succeeded, but their decryptions were faulty, leading to wrong conclusions. Many spent small fortunes themselves digging up Virginia hillsides trying to find the treasure. In 1966 a Tennessee banker employed a backhoe to dig up a considerable chunk of land with no result. A bulldozer was used to level most of a hill on Purgatory Mountain without any better luck. Between 1897 and 1912, two brothers, George and Clayton Hart, took up the Beale challenge. They spent much of their spare time looking for documents that might serve as keys for the other two ciphers much as the Declaration of Independence had been for cipher 2. Though they never managed to decrypt the messages, that didn't stop them from digging at what they considered promising sites. To this end they even employed a psychic, but still found nothing. In 1968 the Beale Cypher Association was founded. This group hoped that by pooling their resources and talents they might finally solve the mystery, but though they have been successful in documenting the story of the Beale papers, they have not found the treasure. Will this mystery ever be solved? Some have suggested that the solution lies not with treasure, but with trickery. What if the Beale papers are a hoax? A notice in the Lynchburg Virginian for December 2nd, 1823 shows that Morriss didn't become the proprietor until three years later. In addition, the Washington Inn wasn't known as the Washington Hotel until after Morriss sold it. Some of the wording in the Beale papers doesn't seem to fit with the time either. For example, a letter from Beale dated 1822 talks about "stampeding" a herd of buffalo. The word stampede (from the Spanish estampida) did not enter into print before 1844, twenty-two years after the letters supposed date. In fact there is no solid evidence that a Thomas Jefferson Beale existed in Virginia in the early 19th century. Also there are no records of an expedition that found gold in California. The original Beale papers themselves do not even exist. Ward reported they had been lost in a fire at Virginia Job Print plant along with many of the pamphlets. If the Beale letters are a hoax there are probably three candidates for the hoaxster. Beale himself, Morriss and Ward. Clearly most skeptics focus on Ward. He published the pamphlet and charged for each copy. Statistical studies of the word usage in the pamphlet suggest that probably all the texts in it were written by a single person, most likely Ward. Little is known about Ward, but unlike Beale, he clearly did exist. Ward grew up in the same section of Virginia as figures in the Beale papers story. It is believed he was a member of the Freemasons. Records show he joined Dove Lodge No. 51 in 1862. In fact, Ward's membership in the organization may give clues to motives he may have had for concocting a hoax. Where did Ward get the inspiration for his story? Several people have pointed to Edgar Allan Poe's story The Gold Bug which had similar elements in it. Also, a Kentucky legend about a man named Swift who discovered a silver mine may have influenced Ward. If the Beale Papers are only a story, what about the two undecyphered messages? Are they merely random series of numbers? In 1971 Dr. Carl Hammer did a computer study of the undecyphered messages and concluded that there were cyclic patterns in the numbers that suggested they were not just random, but most likely text-encoded in the same manner as the decoded cipher number two. So what would the undeciphered messages tell us? The location of a priceless treasure? Or a confirmation that the story is a fabrication by Ward? Until somebody can decipher the messages, if that is possible, we will never know. Try your own luck at decoding the messages with our reprint on the Beale Papers Page.